I’m so enjoying the December e-course, Outside In: A Return to Stillness. It’s kind of turned into a spiritual journey for me. It’s amazing what happens when you focus daily on creating a moment of stillness in the midst of a seemingly crazy time of year. I’m not only experiencing more peace, but I notice I’m having a lot more FUN (while shedding those thoughts and behaviors that create stress). I’m totally soaking up the love that comes from the spirit of the holidays. Yesterday, I had a fake “snow day” with my boys. We stayed home all day in our jammies, playing games and making art by the fire. It was just one of those days I’ll never forget. Not a care in the world. The only thing missing was real snow. But that didn’t even matter. It was the pure JOY of a snow day that swept us up in the moment. We threw away the agenda and for one day – we weren’t tethered to any “to do” list. Just us. Playing, laughing, singing, and celebrating BEING together. And that’s what this season really means to me. How are you feeling? Are you in need of a break from your list? 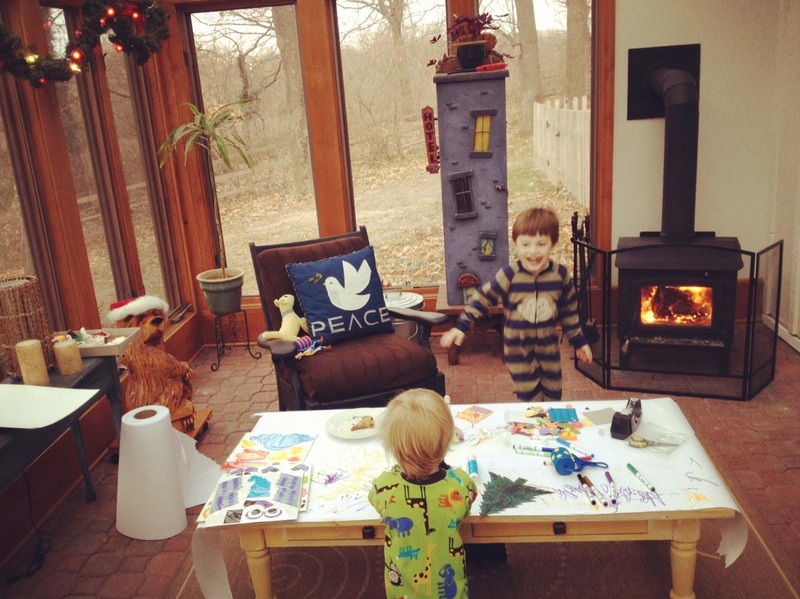 Find peace through play and plan a snow day of your very own! It doesn’t matter if you don’t get snow where you live. Even if you live on the beach or are in the southern hemisphere right now – anyone can enjoy the pure joy that comes from a good old-fashioned snow day! One of my favorite memories as a kid was that feeling of getting out of bed especially early on a dark, cold winter morning – the anticipation of a snow day making it too hard to sleep. The snow is coming down. And you watch, as the school closings run across the TV screen, while the meteorologist talks about how bad the roads are. You rub the sand out of your eyes just to make sure. Your school has been one of the lucky ones…cancelled for the day! YES!!! IT’S A SNOW DAY!!!! The thing that makes a snow day so fun, is that you get to throw away the agenda. You are gifted with a full day of no plans. A full day to be at home with the ones you love most. A full day to change things up. A full day to be spontaneous. A full day for…PLAY! When I was a kid our snow days usually consisted of playing outside for a good part of the morning – making snow people, going sledding, building snow forts… We’d warm up by the fire with hot chocolate and marshmallows. We’d bake cookies, listen to music, play games, make popcorn and watch movies. Warm, snuggly jammies were a must. These times were fun, memorable and oh so very special. Don’t you think it’s time for a snow day? Watch this video: How to Make a Snow Angel for inspiration! Someday this week, “plan” your own snow day. Set some time aside – a few hours or even a full day – and reserve it for spontaneous play! What would YOUR kind of snow day look like? Throw out the agenda and “to do” list and find peace through PLAYING! Post a photo on our A Free Spirit Life Facebook page and show us what you did for your “snow day”. * Photo by Chris Duh.